chhattisgarh became the first state to actively initiate action against biosafety violations in trials of genetically modified Bt rice in India. Besides ordering an enquiry into the matter, the agriculture minister took matters into his hands. Media reports in November showed seed company Mahyco (Maharashtra Hybrid Seeds Company) was conducting trials of Bt rice in a farmhouse located beside the state's Indira Gandhi Agricultural University (igau), which has the one of the richest collections of rice varieties. This is an emotional issue in the state, called India's rice bowl. Anti- gm activists say it is suicidal to allow such trials because of the risk of contamination of the germplasm. The farms where these trials were carried out were set on fire at the behest of the agriculture minister Nanki Ram Kanwar, who visited the trial plot. 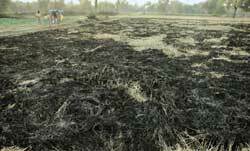 Agricultural scientists have been unhappy, saying crop residue should not have been burnt. The effect on other crops should have been tested for biosafety, they argue. But the agriculture minister is firm. "By not informing the state government about its experiments, Mahyco has breached the instructions given by the Supreme Court," says Kanwar. The seed company has protested the allegations. Defending the company, M K Mishra, manager, Mahyco, said: "Mahyco has the permission to conduct trials of genetically engineered Bt rice in 10 locations across seven states. Besides, Mahyco had already informed the state government about the trials." igau scientists concur, saying they were aware of Mahyco's trials, according to Chitranjan Hajara, university's vice-chancellor. They even visited the farmhouse where the trials were on. But when the state government began looking into the matter, the university went into denial. Investigations revealed that the university itself was involved with trials of Bt rice. The agriculture department has formed an enquiry committee. Its member A S Shastri, a university scientist, says the Bt rice trials in the university were taken up with permission of the Indian Council of Agricultural Research. About the Mahyco trials, he feels the state government should have been apprised about it regularly, and this did not happen.